All Vacations Made Easy tours, river cruises, expedition cruises, and adventure trips. Find the best guided trips and expert planned vacation and holiday packages. 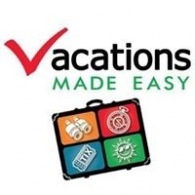 Average rating of 3.7 for all Vacations Made Easy trips. Visit other Disney attractions, including Typhoon Lagoon & Blizzard Beach water parks, Disney's Wide World of Sports, and DisneyQuest Interactive Indoor Theme Park. See the nightlife never stops at Pleasure Island entertainment district. Enjoy the rush of a rollercoaster or the thrill of a 3D show.